According to Clifford Franklin, president of St. Louis-based The Fuse, the agency that created the Black ads, the Soros-financed media campaign is “aimed particularly at those who have an extremely cynical view of the political process" – that is, African Americans between the ages of 18 and 35. The message: "Don't keep getting played"
"Bush said he would leave no child behind. But he wasn't talking about your child." "Bush said prosperity was right around the corner, but he wasn't talking about the corners in your neighborhood." "Bush has a plan for America. But you're not part of it." The GOP has already targeted Blacks in many of these same “battlefield states” (see , “Bush’s Black Attack Dogs,” September 2) with media buys on some of the same stations. Soros’s team directly confronts the intensifying Republican efforts to suppress the Black vote. "The Republicans want you to sit out this election and simply stay home…. Who are they fooling? These are the same folks that are against affirmative action, oppose civil rights. These are the same people against raising the minimum wage. And want to take away overtime pay…. Under Bush, 1.1 million more black folks live in poverty than they did before 2001." Washington Post media analyst Howard Kurtz, playing the usual corporate media game, claims the ad “contains some exaggerations. The administration has not proposed weakening civil rights laws and is seeking to eliminate overtime only for certain employment categories.” Objectively, Kurtz is dead wrong. Affirmative action is a civil rights issue, as is the Patriot Act. Failure to enforce civil rights laws is the same as opposing civil rights, as is nominating anti-civil rights judges to the federal courts. Kurtz sets himself up as an arbiter of the boundaries of civil rights. By his standards, Bush would have to oppose the Public Accommodations Act of 1964 to qualify as an anti-civil rights president! “George Bush misled the American people into a war in Iraq that is draining billions of our tax dollars. While our women and men in the armed forces are re-building Iraq, weapons of mass destruction can be found right here at home in [STATE]. “Under Mr. Bush, unemployment among African Americans has increased by 27%. More than seven million African Americans lack health insurance. And, one in three African American children live in poverty, twice the national average. “For 20 years, John Kerry has fought for civil rights, economic opportunity and fairness. That’s why the Congressional Black Caucus honored him in 2002. That’s why the NAACP recently gave John Kerry a 100% approval rating. “On November 2nd, vote to make a change in the White House. Vote John Kerry for president." This is a strong, yet carefully balanced DNC ad, including negative Bush and positive Kerry narrative. Even Howard Kurtz could not disapprove. ”I will challenge anyone to debate me on Bush's record, versus Senator Kerry's record on issues that directly impact my community, including support for Historically Black Colleges & Universities (HBCU's), faith-based initiatives, minority business development, and health care disparities. ”John Kerry has no record with the black community, and so his supporters in these shadow groups are launching more of the same unfounded, negative, and personal attacks against George W. Bush. ”After 20 years of bad votes in the U.S. Senate, including votes against school choice, against the Child Tax Credit , against marriage penalty relief and of campaigning without any thought to putting forward an agenda for the future, John Kerry is turning to 527's to try and scare African Americans away from President George W. Bush's positive agenda. It is shameful!" However, officials at the Democratic National Committee say the People of Color United ads were actually written by Joe Novak, a white Republican lobbyist for benefactor Rooney’s former holding, the Golden Rule Insurance company. was alerted to this ultra-negative attack ad, one of eight produced by the truly shadowy America’s Pac Campaign, by Vernellia R. Randall, a professor of Law at the University of Dayton. For example, the People of Color United ad makes it appear that Kerry wanted an unemployment insurance extension bill to fail, when in fact the Republicans opposed the measure. A September 1 Pacific News Service/NCM article notes that Black media have been closely monitoring GOP Black voter suppression schemes. But that cannot possibly be true for Black radio stations, most of which do not have news departments. (See , “Who Killed Black Radio News,” May 29, 2002.) 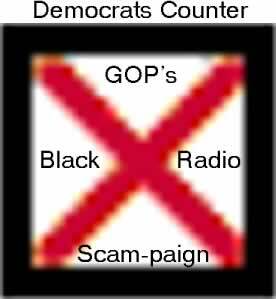 Thus, Black radio, which is largely news-less, will profit handsomely from advertising by Republicans, Democrats and their respective surrogates, while providing no mechanisms to inform their listeners about the real facts of the campaign, or the messages they are hearing. That’s a 365-24-7 crime against the African American public.